Please feel free to add scripts to this page if you think they are helpful (but please give it a --help flag to explain its usage). Also list any prerequisites to using those scripts, including the lowest Python version that's necessary as well as any other Python modules you need to download with it. Required Python modules should be placed either in the same directory as the main script or in a directory included in the PYTHONPATH environment variable. Any of the scripts will either have to be executed with the interpreter directly (python or bash), or made executable (chmod +x <script_name> before you can run it. in the script. You can also normalize the histograms, optionally, so that the function will integrate to 1. This script works just like 1Dbinning.py above, but creates bins in 2 dimensions. It selects "smart" default bin ranges and number of bins. The bin range is determined from the maximum and minimum of the data set in both dimensions, and selects the number of bins according to Scott's Choice. You can also normalize the histograms. Name of gnuplot script to write. 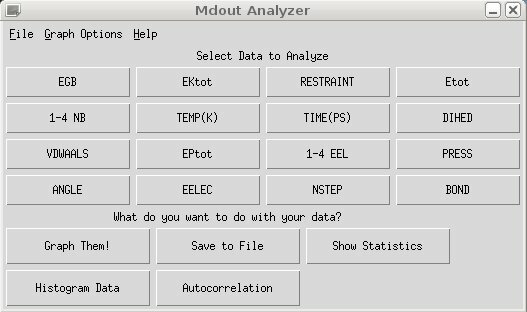 mdout_analyzer.py is now a part of AmberTools. 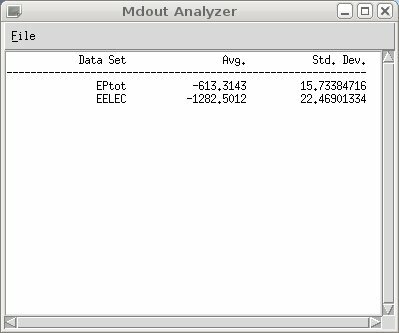 (It used to be called MdoutAnalyzer.py in AmberTools 13). 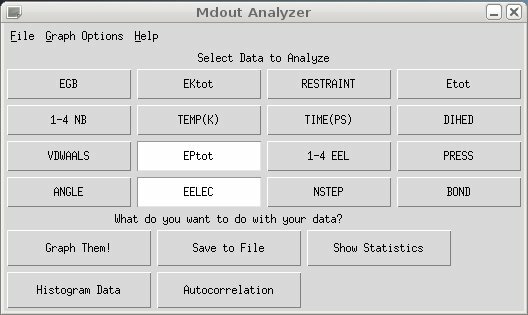 If you provide no mdout files, you will be prompted for one as soon as you launch the program. 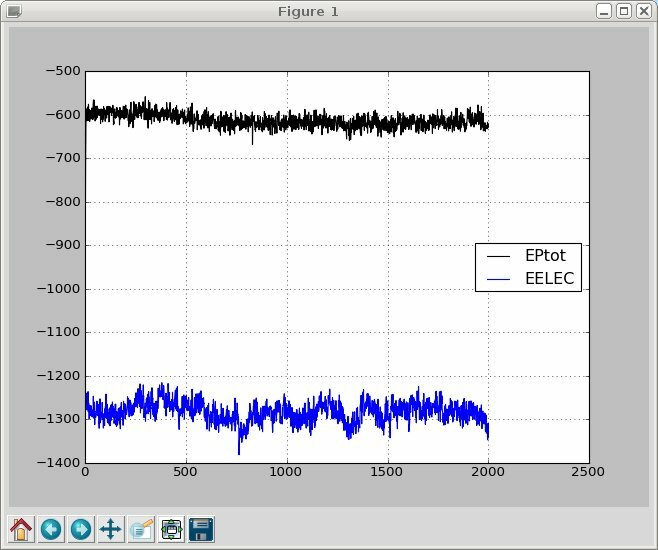 After selecting however many data sets you want, you can do one of 5 things with them — the image below shows the window with EPtot and EELEC chosen. You can modify the graph appearance (e.g., add a title, legend, lines, points, etc.) via the "Graph Options" menu at the top of the GUI. Note, the X-coordinate for all of the analyses is either the TIME(PS) data if present, or a simple enumeration of the number of data points (except for Histogramming, of course, where the X-coordinate is the data you are histogramming and the Y- is either the probability or frequency). This graphs all of the selected data sets side-by-side. An example graph is shown below. You can add a title to the graph as well as axis labels via the "Graph Options" menu at the top of the main window. 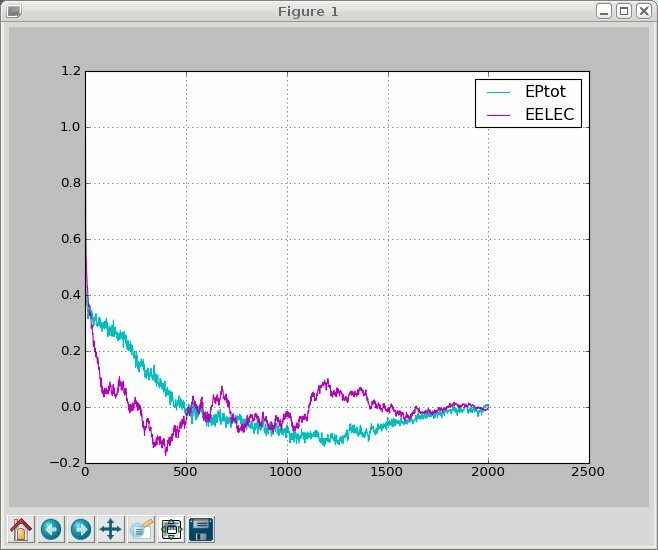 Use the buttons at the bottom of the graph window to save the image to a PNG file or zoom in on a portion of the plot. This brings up a window to allow you pick the file name to save your data to. The data will be printed with one data set in each column where the first column just enumerates the data. If the file name ends in .csv, a comma-separated-value file will be printed. Excel (and other spreadsheets) natively read in this data format. Otherwise, an ASCII file will be printed with 20-character columns per data set. 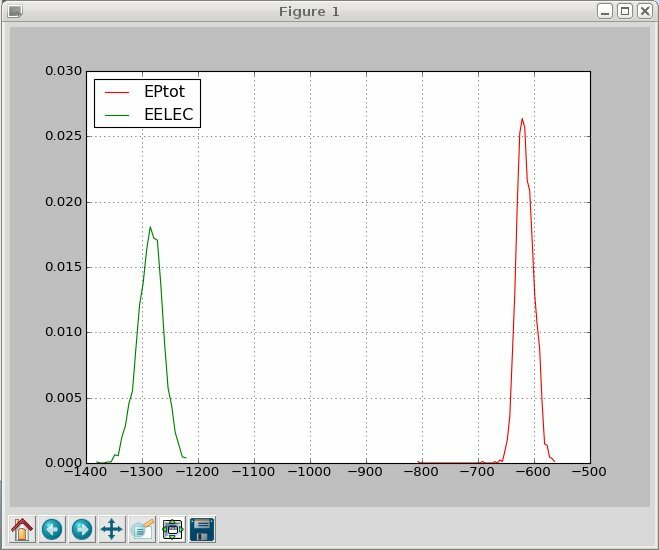 This option will histogram the data and plot those histograms. The default bin width comes from Scott's choice. Otherwise, you can control the bins manually with the "Histogram Bins" option in the "Graph Options". If you put a positive number, that will be taken as the bin width. If you put a negative number, that will be taken as the number of bins you want. (It is not currently possible to provide different bin characteristics to different data sets in the same plot). You can choose to normalize the data or not via the option in "Graph Options". This option will plot the normalized autocorrelation function of the given data sets. In this case, the X-coordinate effectively becomes the 'lag' parameter. By default, the autocorrelation is calculated out to the maximum lag (e.g., out to the total number of frames provided). It is probably best to only consider lags out to half the size of your data set. This script will take a NetCDF trajectory and extract restart files from it. If velocity information is present in that trajectory (because you set ntwv = -1), it will also dump that velocity information into the restart file as well (that part I don't think ptraj or cpptraj does yet). where # is the frame number being dumped. preserve any velocity information that may be present. This is technically a program, written in C++ (with a Fortran namelist parser written in Fortran 90), that is designed to provide many available options for analyzing CpHMD and pH-REMD simulations from sander and pmemd. It is ca. 2x faster than calcpka.F90 that is built right now with AmberTools, and provides identical results. It also does a lot more, like conditional probabilities, running averages, cumulative averages, and chunk averages. periodically to download any updates that I may have pushed to github. Build and use instructions are available on the github website. Beginning with AmberTools 14, cphstats is distributed alongside Amber and is built during the normal build process of AmberTools. [Output Options] below for details). is printed (see [Output Options] below for details). the number of MC exchange attempts). for options) over the course of the trajectory.